Hey Abbé Boulah, I’m glad to see you here — I have a question for you. And a good evening to you too, Bog-Hubert. What’s such an urgent question that won’t even let you order a drink to start with? Ah, Vodçek knows what I need. Well, I ran into that candidate for the Senate I told you about, who is thinking about running on a platform of legalizing illicit drugs, so we had a little exchange about that over at the dock. And then I remembered you’d talked about this group in Australia that held a big discussion on the internet about that same question — whether the country should legalize drugs. Asked people on the internet to vote on it, based on the arguments they posted. So what’s you opinion about that issue? Ahh — which issue — legalizing drugs or that discussion? That sly question itself tells me you don’t want to come clean on the legalizing problem. Is that because you don’t agree with the other policies of this Senate candidate? Okay, So what’s your take on that Aussie discussion? You know me too well, Bogmeister. But the drug problem is really an issue I haven’t made up my mind about. I haven’t really thought about it that much lately — and that discussion didn’t do much to sway my opinion either way. Why is that? You seemed quite excited about the piece the other day? Yes, but that was because of the curious way they stated their arguments, not so much about the content. Let me explain. This is a group that puts up some interesting controversial issues for online discussion, presents a ‘pro’ and a ‘con’ statement — a video with transcription — invites followers to join the discussion and to vote on it. So far, I’ve only read the transcript; you know I get impatient with all those videos. And it gave me some interesting insight into how many people argue such cases, especially in view of our old problem of how one should go about carefully and systematically evaluating such arguments before deciding. 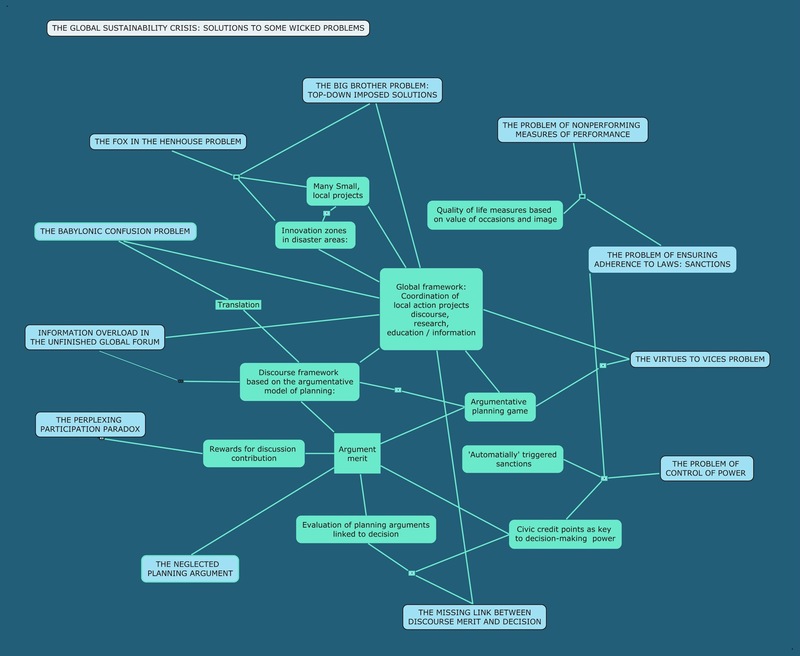 And mapping the discussion to give people a better overview. Cripes, now it’s getting theoretical. Can’t be helped. Cheers. Well, the first guy, the proponent of legalization begins by stating that drugs should be legalized because the ‘war on drugs’ has been a failure. And he cites the opinion of community leaders who acknowledge this. Okay. Does he mention specifics of that failure? Oh yes; he lists a whole lot of them: Aims of the ‘war on drugs’ that have not been achieved. And does he provide any good evidence for that? That’s the interesting part. No, he just states the claims. He even started out by saying those failures are ‘self-evident’ . Which means: no evidence needed? But wait: those aren’t really arguments for legalization, but against — what — the war on drugs, continued prohibition? Good point: you are making progress in this business. They are all arguments against the alternative proposal, the status quo — that hasn’t been stated. But of course it’s there, implicitly, as the current ‘solution’ that should be replaced. And the interesting part is that listing those failures of the status quo they are making some implicit claims. Claims that maybe should have been made explicit. What claims? Other than that the war on drugs is a flop? One implied claim is that there is a drug problem that should be tackled somehow; — that probably isn’t controversial, so it doesn’t have to be mentioned because it’s assumed everybody agrees on it. But he characterizes that problem differently: he says it’s a health and social problem, not a criminal one. Which therefore calls for a different approach to deal with it. And even more interestingly: doesn’t he make the implied claim that there are only two possible solutions to it — prohibition and legalization? There’s no mention of any other possibility. And if so, the arguments against the war on drugs do become arguments for legalization (in a listener’s mind) — even though he doesn’t explicitly state those arguments. What he says, without saying it, is that legalization would in fact achieve all those aims of the war on drugs. So what you are saying is that in order to make a thorough evaluation of all the pros and cons, these arguments should be made explicit, and listed in the evaluation worksheet for that purpose — where you list all the premises and give them scores for plausibility and weight etc. Right. That bothers me. The arguments have been slipped into the audience’s mind. But they haven’t been stated openly. Why does that bother you? If they aren’t stated, they can’t be evaluated. True. But they are sticking in the mind. So they will subtly or not so subtly influence any vote, won’t they? They also can’t easily be shown on a map of the discourse, at least if we stick to the rule that the maps shows issues that have been raised. And if they aren’t stated and shown, they can’t be questioned and scrutinized, as some of them should be. Well, look at some of the so-called ‘aims’ of the war on drugs: while some are easy to agree on, others are puzzling: for example, the ‘aim’ that drug quality — purity — should be reduced. This helps to make drugs less appealing because more dangerous — but is this also an aim of a n y overall effort to deal with the drug problem? One that legalization would achieve more successfully? I don’t know, it looks like one that should at least be discussed, no? But since it’s not stated, it’s just part of a long list of arguments against the alternative of prohibition that now works just because of its length. Interesting, huh? Well, I’m sure that doesn’t make too much of a difference among all the other arguments for and against. What were the other pro-legalization arguments? There weren’t any in the proponent’s statement. Or only very few, really. You’re kidding me. Even I can come up with some good arguments about that. So what was he talking about, then? He was providing information about a very plausible question — one that any undecided person would be likely, even prudent to ask: the details of the legalization proposal. He talked about — as I mentioned — treating the problem as a health and social issue calling for health and social intervention measures, about shifting funding from law enforcement to such programs, about moving slowly and incrementally, about taxing cannabis, about licenses for production, sale, distribution of drugs, about establishing supervised needle and injection centers as well as other treatment facilities. Sounds reasonable. People should know enough about the details of such projects before voting on them. I can’t argue with that. The problem is: how should such descriptions be dealt with in the argument evaluation? Why would they? They are just descriptions of the proposal — he didn’t make them out to be ‘pro’ arguments, did he? Not explicitly, no. But devoting a considerable part of the presentation on these details, aren’t they meant to be part of the ‘pro’ case? So the description of all these niceties stick in the mind as favorable features — but since they are not stated as arguments, they also will not be examined, questioned for their validity, plausibility, importance in view of the yes/no decision. For the usual practice of asking people to make a decision — vote yes or no — on the basis of such a rhetorical presentation, they will do the intended job, quite nicely. But for a systematic evaluation, prompting questions for supporting evidence or other supporting arguments, this practice poses some tough questions. Should such points be included as explicit arguments? And whose responsibility is it to do that? Whose responsibility? You mean the proponent or the opponent? Or some other person or component of the system? By the way, talking about the opponent, wouldn’t he bring these issues up if he thought they would make a difference? What did he say? Hey, wasn’t that just what the legalization proponent said? That it’s a health and social problem, not a criminal one? And he used that as an argument for continued prohibition, that is, criminalization? Curiously, yes. But the case is made mainly by straight-out negation of the claims of ‘war on drugs’ failure (but he does not use the term ‘war on drugs’ ). He contradicts the proponent’s claims — the UN controls a r e working, the problem would have been much worse without them, and so on. Most of the claims of ‘failed aims’ are denied — but just like those, without offering additional evidence or support. There are some statistics thrown in, but they are not compared with any corresponding data for the proposed legalization, so they just give more of an impression of evidence than constituting a real substantial data-based argument. The remainder of the case is based on a number of claims of aims that legalization will not achieve, only some of which match the items in the proponent’s list of aims not achieved by the war on drugs. And most if not all of those statements are aimed at claims and arguments the proponent did not state: they are ‘presumed’ claims of the pro-legalization side. They could have been claims that had been made in other documents and media statements: things the opponent had heard before, that are common knowledge? True. But some of them could also fall into the class of ‘straw man’ arguments — strange arguments attributed to the other side that are easy to demolish, and thereby giving the impression that the entire case of the other side is as shaky. But there wasn’t even much demolishing — with additional evidence — just denying those presumed claims. So you are saying that those denied claims should be added to the proponent’s arguments before doing a detailed evaluation, is that it? All that would add some considerable complications to our evaluation process, wouldn’t it? Very true. And to the mapping task. Because the picture of each sides’ issues and arguments now looks very different from the proponent’s and the opponent’s side. Should the map show only the issues and arguments each side has actually stated? Or the implied ones the other side is attacking? Maybe it will be necessary to make up different maps for each side. Yeah, that will cause some additional quarreling: which map is the ‘real’ one? Wasn’t the idea that such maps would show a kind of ‘objective’ picture of what’s being discussed? And now you are suggesting that the maps too become partisan? I say, that item did raise some troublesome issues about such discussions and how the framework should support them. Indeed they did. More than it helped me make up my mind about the drug legalization issue. Based on the arguments proposed in that experiment, I am not ready to cast a meaningful vote on whether drugs should be legalized. But wouldn’t you also say that those very problems make more systematic evaluation that much more important? While that was probably not their intention, we should be grateful for such groups to raise the issue of how such decisions should be made and argued. And the example might help us design a better argument evaluation approach. I can’t argue with that. Get to work. Cheers. A dirty dozen world-wide wicked problems related to the global sustainability crisis – and some solutions? 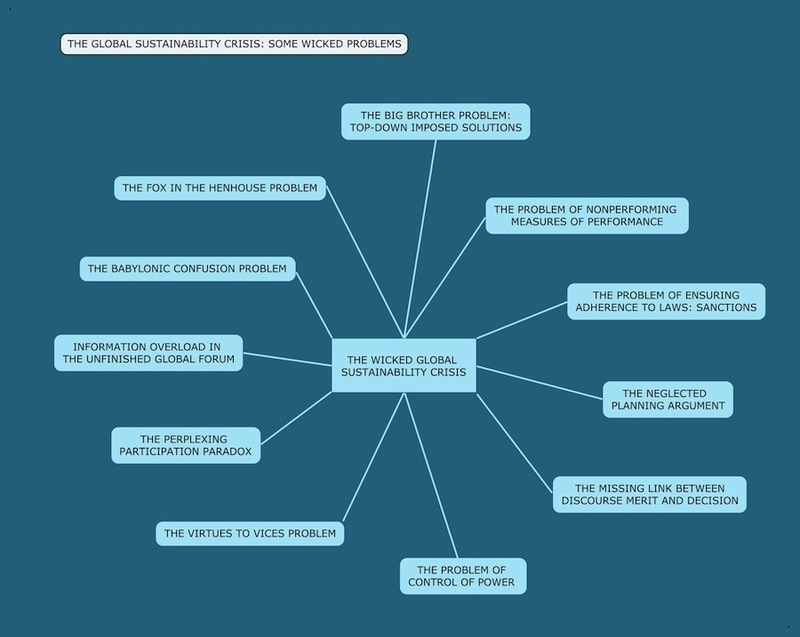 The following problems are a subset of problem facets related to the global sustainability crisis. The list is not an exhaustive account of all problems that make up the global crisis; they are selected because they are seen as key interconnected factors, and to show how some solution ideas can address this network of problems. for generating many of the problems — and therefore being justly or unjustly suspected of pursuing their agenda more than the common good. There are already many impressive efforts underway to address these problems — mostly at the small and local level. But coordination and communication between these efforts is severely hampered by the differences not only between natural languages, but also between different cultural mindsets, ‘ways of talking’ about problems, approaches and solutions, between the specialized vocabulary of different disciplines (even between different schools of thought within the same fields) and their arcane acronyms. While it might seem that new information technology is in the process of vastly improving global communication, it can be argued that it has led to an almost insurmountable overload of disorganized information. This is making it difficult to keep adequate overview of developments even about very specific issues, establish and maintain a constructive discourse leading to meaningful agreements and decisions: The development of an adequate forum and platform for the global participatory discourse is still a very much unfinished project. In the face of the call for more participation in planning, policy-making, and political decisions is the evidence that public participation even in the form of voting in elections, let alone true constructive discourse and dialog, deplored as lacking: ‘voter apathy’. This is true even in societies where technological infrastructure, education and information would seem sufficiently advanced. Already Bertrand Russell (in his 1938 book on Power) observed that participation decreases as the social unit increases in size because in larger units, the impact of individual votes and contributions is perceived as so negligible as to render the individual vote or participation utterly insignificant and not worth the effort: participation is related to perceived possibility of ‘making a difference’. Part of the participation problem is the fact that the decision-making method even in advanced ‘democratic’ systems, majority voting, has little or no perceptible (‘transparent’) connection between the value and merit of discussion contributions and the decision outcome. Phenomena such as ‘party discipline’ or the fact that filibusters can delay decisions but not influence them (because nobody is listening) are proof of this missing link: votes can entirely disregard or even go against the result of deliberative discourse. In spite of the tremendous amount of work done in logic and, increasingly, in ‘critical thinking’, the kinds of arguments we use in design, planning, policy-making — the ‘pros and cons’ for or against proposals — have not been given enough attention; coherent approaches for their systematic and transparent evaluation have not been developed. Discussions about how to overcome the problems and crises are full of recriminations about human vices that are held to be responsible for the problems: greed, pursuit of power, the ‘win-lose’ attitudes in economic and political matters, the lack of empathy with ‘losing’ groups, the preoccupation with profit and growth. The result is an increasing polarization between groups that have achieved success with such attitudes, and their critics. The latter tend to forget or downplay the fact that these attitudes have often been taught to children as virtues. Now demonizing the people and groups who have learned these lessons well — as compliant learners, following societal concepts of virtue — can hardly be a successful strategy for a more cooperative, win-win- oriented, compassionate form of socio-economic society. Significant efforts have been made to establish reliable arrangements for the control of power in government. It is not clear whether these controls are inherently sufficient, and just have not been applied properly in the many instances in past and recent history where government powers have turned abusive and destructive. But it is evident that similar controls have not been developed and applied in the private sector. As a result, certain forces in the private sector have become so powerful that they have significant — and largely uncontrolled — influence over governments. This problem calls for increased attention, study and creative solutions. Even if governance systems could be developed in which societal arrangements, laws, treaties etc. were negotiated and refined until they become acceptable to all affected parties (ideally: by consensus); the question remains of how to ensure adherence to the agreement s and laws: how to deal with instances of noncompliance or violation. Traditionally, compliance has been ‘enforced’ through the threat of imposing sanctions, penalties, by an enforcement agency that necessarily must be stronger, more powerful, than any potential violator. Inevitably, this raises the question of how to control such power: how to prevent that enforcement agency from violating the very laws it is supposed to enforce? The means of enforcement through sanctions of the same kind is logically impossible, if there is no ‘bigger’, more powerful agency. Again, this problem becomes critical at the global level: how can a ‘world enforcement agency’ more powerful than any other entity be effectively kept from abusing its power? Control and effective management of any complex process requires adequate measures of performance. Many social and economic problems are blamed on the use of measures of performance that are counterproductive to sustainability, social equity, fairness, and responsive stewardship of the environment; such as gross domestic product, profit, or growth. While this problem has been widely recognized and has led to calls for alternative measures, no convincing solutions have been proposed that are both widely acceptable and also can be smoothly introduced into economic systems operating on traditional principles: the transition problem to a system operating on different assumptions has not been adequately discussed nor solved. These ideas are selected not because they solve all problem areas of the global sustainability crisis, but to highlight how solutions can aim at several issues. A global communication framework is needed for the coordination of many diverse, small local action projects and initiatives that should be encouraged and supported both as innovation laboratories for experiments with new approaches in all areas of societal organization and opportunities for people to pursue their visions, within a global framework of agreements for cooperation and conflict resolution. Its main components, besides the various action projects, are the coordination component, the discourse component, the research support component, and the education / information component. A key innovative feature of the proposal is the structure of the discourse component, which is based on the argumentative model of planning and policy-making (spearheaded by H. Rittel). The elements of the information support system for the discourse are issues (controversial questions) and the answers and argument to those issues. The argumentative model of the discourse component is enhanced by the provisions for systematic evaluation of the planning arguments (and other discussion contributions). The aim of this feature is to develop a measure of support for plan or policy proposals based on the merit of arguments: a measure of the merit of the discourse. The resulting measures can then provide the missing link between discourse merit and to decisions to be made — a link not adequately ensured by the current majority voting method. The measures of merit of discourse contributions can be used to provide meaningful ‘rewards’ for participation, countering the problem of voter apathy even for large projects and constituencies. To familiarize citizens with the tools of the argumentative discourse — faster than would be possible through the current system of public education — it is proposed to develop an ‘argumentative planning game (including the evaluation component discussed in items c and d above). The game aims at promoting (and rewarding) cooperation (rewarding win-win outcomes), critical thinking and evaluation; and should be developed both for ‘live’ applications and for wide participation in large planning discussions via videogame, cellphone and internet technology. The measures of discussion contribution merit creates the possibility of establishing ‘civic credit point’ accounts for citizens, which provide legitimation / authorization for public decision-making (i.e. power) positions. Decisions require a ‘performance bond’ or ‘investment’ of credit points, used up with each decision, but with the possibility of earning further credit with successful decisions. This can provide a form of control of power: Power decisions can only be activated with adequate credit. Instead of traditional sanctions to ensure adherence to agreements and laws that have to be enforced by ‘enforcement’ agencies with greater power than any potential violator, forms of sanctions should be developed that are automatically triggered by the attempt at violation. Such provisions — perhaps involving the ‘civic credit points’ idea outlined in item f — would help solve the problem of controlling / constraining the power of global ‘enforcement’ entities. Innovation efforts (and funding for these) are often resisted by existing structures that see these as competition and unwarranted ‘unfair’ expenditures. The proposal to encourage the establishment of ‘innovation zones’ for experiments with alternative organization of social and economic practices in areas damaged or destroyed by disasters sidesteps this problem. Emergency aid that will be spent in such areas might be devoted to innovative infrastructure and organization instead of mere re-construction of traditional structures. Successful experiments will encourage adjacent areas to adopt new practices and solutions; less successful efforts will gradually be replaced by improved traditional solutions — but will have produced valuable information about what works and what does not work. While governments everywhere are beginning to follow the initiative of the kingdom of Bhutan in introducing quality of life or citizen happiness measures, to complement and perhaps eventually replace traditional economic measures such as growth or Gross Domestic Product, the indices adopted are usually quite general and therefore not very helpful in developing policies for improvement. An approach growing out of work to develop better measures of the value of built environment suggests an alternative set of measures of the quality of human experiences (‘occasions’) and the imagery evoked by the settings for these experiences. The resulting measures would be much more detailed, allow pinpointing the specific features of the environment or life conditions influencing citizens’ value assessments, and would therefore be more helpful in suggesting projects and policies for improvement.